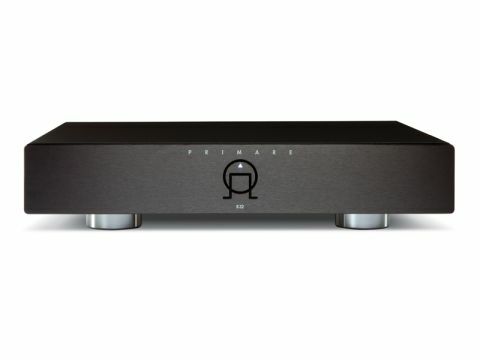 Primare's new R32 has got to be the biggest phono stage on the market for under a grand. In fact, you could fit a dozen Dynavector P75 MkII stages inside it! Size is not usually considered a bonus in such devices but it has two benefits: you get a component that matches the rest on your rack and it's extremely well built. You also get plenty of space between the power supply and the internal circuitry. When you are amplifying the pitiful output of a moving coil cartridge you need the quietest environment you can get and this is one way of achieving it. In 2009, we reviewed Primare's R20 phono stage, which was half the width of the R32 and nearly half the price, but had the unusual feature of variable gain for the MM input only. The R32 also has this quirk, which suggests that is uses the same circuit. However, all that extra space allows for a totally revised and largely dual-mono power supply. Components used in the low-noise design include polypropylene caps and an R-core transformer with separate windings for left and right channel power supplies, Primare also uses Tantalum and low-impedance caps in this crucial part of the amplifier. There are, however, no capacitors in the DC signal path, which might explain why it has such impressive grip in the bass. Wide-spaced RCA in and output sockets flank a pair of impedance selectors for MC cartridges (changing MM gain involves removing the lid). Build quality is superb – Primare's aluminium casework is top-notch gear and looking at the majority of the competition at this price you wonder how it can be done. Presumably its down to using the same chassis that the company employs for other components and the economies of scale it brings. The only practical flaw in the design is the placement of the grounding post – this is quite a way from the input sockets which meant that only one of the earth leads on our SME arm cable would reach. The sockets themselves are very decent, though, – much like the overall build. As suggested above, this is a solid sounding stage. It's a little on the dry side by the standards of the Trichord Dino+ that we use as a reference, but is more revealing, incisive and sure-footed. With the low-ish output of a van den Hul DDT II (0.4mV) gain is a little on the low side, but not to the point where dynamics suffer – you just need to wind the wick up a bit more. We really like the solidity of timing that it brings to the sound of every slab of vinyl that's spun, be it a high-tempo or chilled-out tune, you always know where each note starts and stops. This is partly because of the balance, but largely because detail-resolution is very good, the acoustic around voices is well defined and they can really project into the room with remarkable realism. It's better at texture than tone and is not for those looking for a lush sound, rather it brings some of the precision of digital formats to vinyl which is preferable to excess warmth. Bass grip The combination of superior build quality, a good selection of matching options and a taut, revealing sound make the R32 a good buy, even at its high price. It doesn't have quite the thrill power of last month's Dynavector stage, but it does give you more bass grip and an equally engaging end result. If you want to add a bit of substance and integrity to the sound of your vinyl and have the shelf space, the R32 is winner.